So, while perusing the web looking for crafty ideas, I came across several versions of leaves cast in concrete. Absolutely beautiful. But after checking out the cost of supplies at the Home Depot, I decided that maybe I could scale mine down a bit. 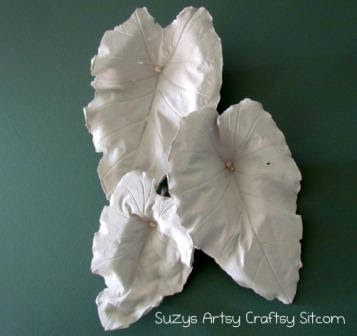 So, while perusing the web looking for crafty ideas, I came across several versions of leaves cast in concrete. Absolutely beautiful. But after checking out the cost of supplies at the Home Depot, I decided that maybe I could scale mine down a bit. 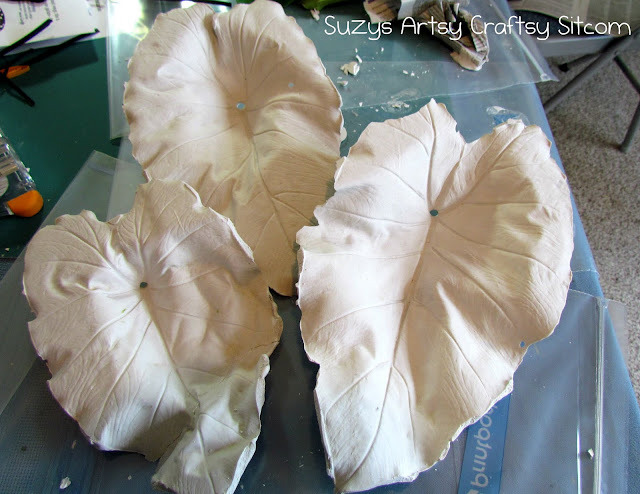 I already had plenty of Plaster of Paris, so I decided to try my own version of plaster casted leaves. I began by covering my table in plastic. You can use trash bags for this or in my case, I used large plastic bags. Crunch up some newspaper to put under the upside-down leaf to support the center. (You don’t want your leaf to be flattened by the weight of the plaster). 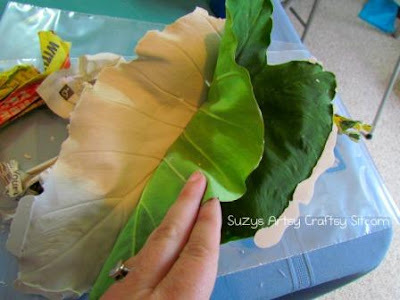 Roll up more pieces of newspaper and put under the edges of the leaves in several places to create nice waves in the leaf. 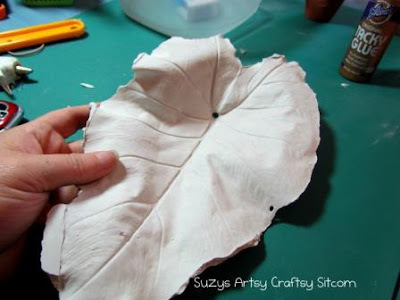 You will have to use one leaf for every plaster casting as the leaves lose a ton of texture if you try to re-use them. Mix the Plaster of Paris with water in a plastic cup. Add enough water to make the plaster a consistency similar to yogurt. Then spoon the plaster over your leaf. Plaster does not stick to the leaf and in some cases will try to roll off, but be persistent. 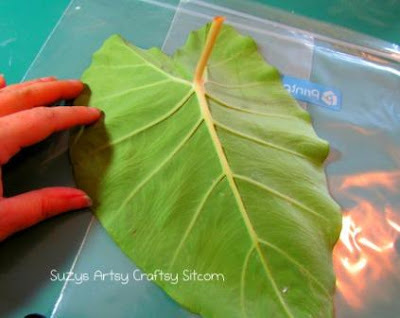 Try to spread it just to the edges of the leaf, creating a layer of plaster over the leaf that is about ¼ inch thick. Now at this point, if you are smart, you will add a hanger of some sort into the plaster before it dries. Something like a pop can tab works great. I’m not that smart, so I did not do this and had to come up with a plan as to how to hang them after the fact. But live and learn. 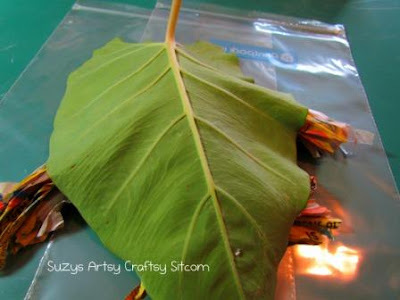 Now allow the leaf to dry for at least an hour. Don’t get all antsy like I did and try to unmold it before it is totally hard. These leaves are fragile and if the plaster hasn’t set completely, it will break into a bunch of leafy pieces. Ask me how I know. Now, flip your mold over and peel off the leaf. Awesome. If you are messy like I am, you may have to do some trimming on the edges. Carefully use a craft blade to score the edges and then snap off the extra in little pieces. Keep in mind that these plaster leaves are fragile. “Fragilayyy! Must be Italian!” (My favorite line from “The Christmas Story”). Since I wasn’t smart enough to put in hangers, I knotted some hemp cord and strung it through the hole created by the leaf stem and used that to hang them. Then I just arranged them in a nice little group on my wall. I totally would have done more, but I broke one when I couldn’t wait for it to dry, and the husband had a fit because I was cutting leaves off of his prized Elephant Ear plant. But three is a good number. And his prized Elephant Ears are now preserved for eternity! 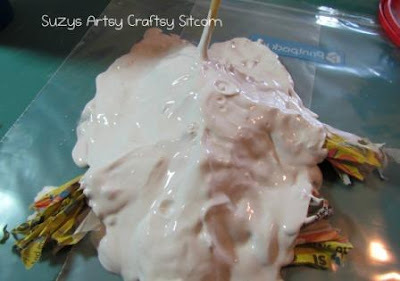 If you enjoyed this tutorial, you might like my Plaster Casting with Sand tutorial. Using my handy-dandy plaster, and sand as a mold, I created some sunny plaques. 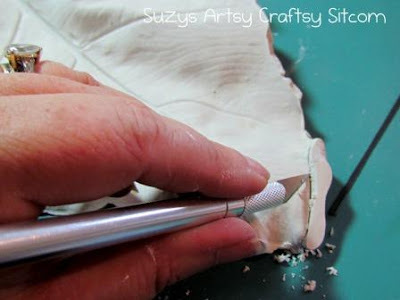 Or check out my Faux Textured Chair Rail tutorial- another way to use plaster to create a great textured chair rail. Those are awesome! Think of all the possibilities. I’m headed to your blog to see what other goodies I can find. This is great and looks wonderful on your wall You are smart ! Love, love, love it! I’m now your newest follower! How wonderfully crafty of you and I love this idea! How lovely! I totally love this idea, I am adding this to my todo list! Maybe I can use up all the fake leaves I’ve grown tired of looking at. Then no live leaf shall be harmed in the making of its plaster likeness. Hey, I enjoyed that it was both funny and informative. A twofer fer shure! You are so influential on me I will be forsaking my first love (vintage and thrifted textiles) to try this. Off to check out your other tutorials and your blog! LOVE YOU! Found you via Pinterest, and am now your newest follower. I wish I had elephant ear leaves-we used to ride them in N.O. when we were kids! Your project is so unique, and very attractive. PS I get impatient with drying times, too! I too love the concrete cast ones and saw a few here at the Missouri botanical garden in St. Louis. But they we quite expensive. I wanted to ask you if you’ve tried to do any in color other than just the white? I have a leaf-crazy four-year old and have 3 years worth of leaf treasures crumbling around the house. How lovely to have such a neat way to now preserve her favourite finds! Thanks for this! A friend of mine made these using hosta leaves flipped onto a pile of sand instead of the newspaper. This so reminded of when I did a lot of plaster casting. I never would have thought of your idea these are so neat. Thanks for sharing and just put you in my favorite blogs. Best to you in 2012!